The Innovation Institute for Food & Health culminated their inaugural visioning process with a two-day Solution Summit on December 2 and 3, 2015. 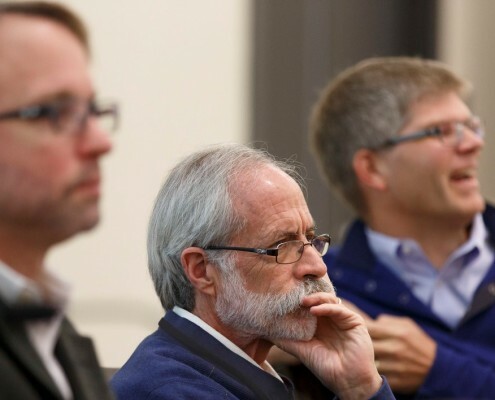 More than 300 participants attended, spanning the entire food system, from production to processing, distribution, sale and education – including representative investors, faculty, community groups, entrepreneurs, students, researchers and corporations. Prominent Challenges in Modern Food, Ag & Health: Panel members field a question from the audience (left to right: Matthew Lange, Associate Director, Initiative for Wireless Health & Wellness, UC Davis; Joaquin Ruiz, Dean, College of Science, University of Arizona; Harold Schmitz, CSO, Mars, Incorporated). Image ©Fred Greaves 2015. On the first day, attendees self-selected into either The Mixing Bowl led “idea hack”, or the Apps for Ag led “hackathon”. Many were unfamiliar with “hacking,” where interdisciplinary teams work together to address specific challenges by proposing action-oriented solutions or innovative software applications. The idea hack engaged representatives from UC Davis, the food industry, non-profits, venture capitalists, farming and ranching, and the hackathon blended challenge champions, software and hardware developers and business leaders. Following a series of workshops and focus groups leading up to the event, the second day of the Solution Summit concluded the visioning process for the newly-formed Innovation Institute, and provided the basis for an open call for innovations in early 2016. A day-long showcase of thought leadership revealed unlikely solutions to diverse global issues: crop water management, ag waste conversion, water desalination coupled to energy generation, the balance between environmental impact and animal efficiency, diabetes management, cook-stove manufacture to ease deaths in the developing world, food safety in Rwanda, unique opportunities for food and ag investment, and novel approaches to food behavior and equity. In 2016, IIFH then funded uncommon collaborators that proposed the kind of real-world answers that emerged from the two-day Summit. Through an international research and funding network, IIFH compiled a portfolio of pilot projects for growth beyond proof‐of‐concept to scalable application and impact. CropRescue! 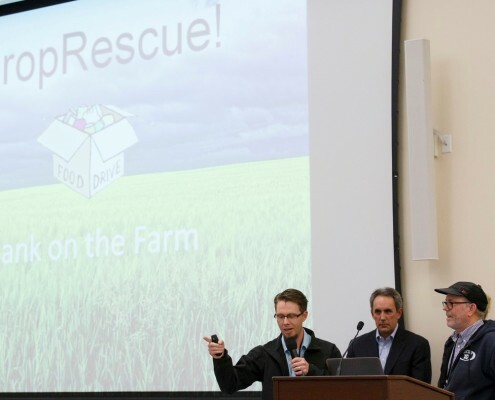 Apps for Ag hackathon winners will donate prize money to support Yolo Food Bank’s implementation of a food waste solution (under the guidance of food bank Executive Director, Kevin Sanchez; center). Image ©Fred Greaves 2015. A big thank you! Summit hosts for the Innovation Institute (left to right): Bob Adams, Institute; Patrick Dosier, Apps for Ag; Kyeema Zerbe and Justin Siegel, Institute; Elif Ceylan and Rob Trice, The Mixing Bowl; Andy Johnston and Harold Schmitz, Mars, Incorporated; Michael Rose, The Mixing Bowl. Image ©Fred Greaves 2015. 1st Place ($5,000) – Ag for Hire: a marketplace for farm laborers to find work on small farms (and vice-versa), also winning the People’s Choice Award ($1,500).